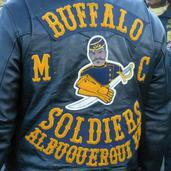 ​The Ride To Honor is an annual ride and memorial sponsored by the Albuquerque, NM chapter of the Buffalo Soldiers Motorcycle Club. The ride travels from the New Mexico Veterans' Memorial, in Albuquerque, to the Santa Fe National Cemetery. A wreath laying ceremony is held at the Fort Craig reinterment site to pay special honor to the Buffalo Soldiers. Tribute is also given to all veterans buried at the Santa Fe National Cemetery. Local historian Dee Brecheisen died leaving a large cache of artifacts which were sold as part of the estate. A tipster tells the federal authorities that among those artifacts was the mummified corpse of a black soldier Brecheisen had looted from Fort Craig. Federal agents find the skull, then exhume the entire Fort Craig cemetery to identify and preserve the remains from further depredation. A vast search of military and civilian archives plus copious forensic analysis ensued in an attempt to identify the bodies. With some investigating and modern forensics, government archaeologists were able to identify the remains of Army Pvts. Thomas Smith, David Ford and Levi Morris. They were among the famed Buffalo Soldiers, African-American members of the U.S. Army who served at remote outposts on the western frontier. Medical records showed that Morris died from an ax wound to the back, Ford succumbed to a spinal infection, and Smith suffered complications from typhoid fever. The Bureau of Reclamation placed newspaper ads in the hometowns of Smith, Morris and Ford in hopes of finding descendants, but two of the soldiers were former slaves and finding family lineage has proven difficult. Smith was from New Market, Ky., and died in 1866; Ford was from Taylor County, Ky., and died in 1868; and Morris was from Akron, Ohio, and died in 1877. On July 28, 2009, more than 130 years since their deaths, they were laid to rest with full military honors at the Santa Fe National Cemetery. The three soldiers have named headstones with birth and death dates, and forensic sketches of what they looked like when they were alive. The ceremony marked the end of an exhaustive project by the U.S. Bureau of Reclamation, which exhumed more than 60 sets of human remains of men, women and children in 2007 after widespread grave looting was discovered at the historical Fort Craig cemetery in southern New Mexico. Fort Craig protected settlers from American Indian raids in the late 1800s. Union troops stationed there fought the Confederacy as it moved into New Mexico from Texas in 1862. The three soldiers belonged to the U.S. Colored Troops, the African American military regiments created after slavery ended. The Smithsonian has kept a few bone fragments in hopes of identifying more remains. The Ft. Craig Cemetery Final Report, which has been place in the left margin of this page, details the archeological research, exhumation and study in much greater detail.